Poland has issued an official apology for its right-wing MEP, who, in an ill-considered attempt to compare the EU policies to those of Nazi Germany, referenced an infamous Nazi slogan, “Ein Volk, ein Reich, ein Fuehrer,” in front of the EU Parliament. 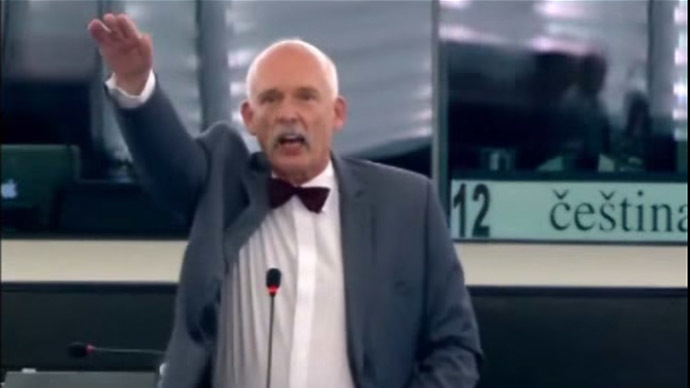 Addressing the EU Parliament earlier this week during the debate on the German-led motion to introduce integrated ticketing for travel across EU borders, Janusz Korwin-Mikke, leader of the Coalition of Polish Republic's Renewal Freedom and Hope party, made a Nazi salute as a sign of objection to the German proposal. Then, raising his hand in the Nazi salute he said: “This time it is, Ein Reich, ein Volk, ein Ticket,” in a play of words referring to “Ein Volk, ein Reich, ein Fuehrer” (One People, one Empire, one Leader). The incident caused an uproar in Polish and European media, forcing Poland’s Foreign Minister to apologize in his country’s name for the right-wing Polish MEP. Following the scandal, the European parliament is looking at a potentially holding Korwin-Mikke responsible for his behavior. “We have already launched a procedure to take sanctions which are available to us. A decision is likely to be taken during the next plenary session. Those measures range from the loss of a daily expense[s] allowances, to restrictions to attend EP plenary sessions,” a spokesperson for the EP President Martin Schulz told Newsweek. Polish media even suggested holding Korwin-Mikke criminally responsible for violating Art.256 par.1 of the Criminal Code which prohibits the “public promotion of a fascist or another totalitarian system” that “incites hatred based on national, ethnic, racial, religious differences.” Violators of this article are subject to a fine and/or imprisonment of up to two years. “We can only be ashamed that we chose such a man as a representative of our country to Strasbourg,” social philosopher Jerzy Bukowski wrote in an opinion post in wPolityce. According to the investigation carried out by TVN24, Poland’s 24-hour news channel, it turned out that Korwin-Mikke had consulted a fellow MEP – German satirists and founder of Die Partei, Martin Sonneborn. According to Sonneborn's Facebook post, before taking to the floor, the Polish politician asked him “politely” in English the German word for a ticket. “A single currency, unifying everything, Hitler even promised to eliminate smoking,” Korwin-Mikke said.